Grand Canyon National Park is the epitome of adventure destinations in the American Southwest. Whether you’re looking to stay in a campground, one of the historic Grand Canyon hotels, or explore deep in the Grand Canyon backcountry, you will have the experience of a lifetime exploring this natural wonder. Travelers to the Grand Canyon have many different activities to choose from such riding the historic Grand Canyon railway from the town of Williams, day hiking, backpacking, mule rides, visiting the Grand Canyon skywalk, and rafting the mighty Colorado River. Celebrate the Grand Canyon National Park Centennial! AOA has been guiding in Grand Canyon National Park for over 20 years. Join us for a guided hiking, backpacking, or cycling trip to celebrate the park’s centennial! We recommend spending a few days at the canyon, taking the time to hike and explore. If you only have one day and are hoping to plan a quick day trip from Phoenix or Scottsdale, consider AOA’s Grand Canyon “Fly & Hike.” This narrated flight brings you to the canyon for a guided hike below the rim with a picnic lunch. 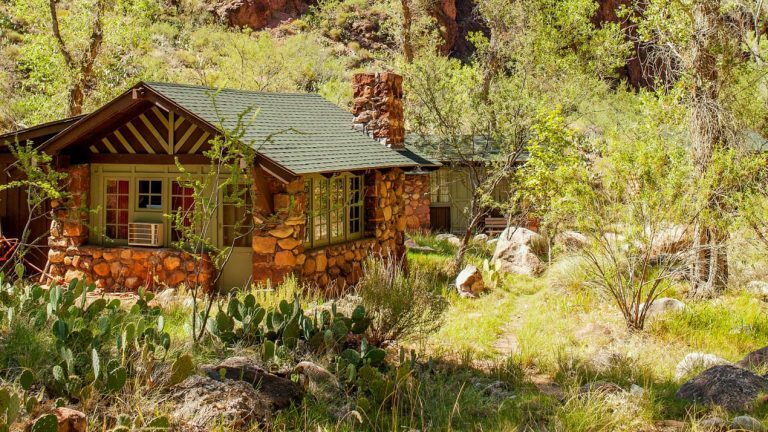 One of the most exciting things to do when visiting the Grand Canyon to stay the night at Phantom Ranch, a historic lodge at the bottom of the Grand Canyon. All of the Ranch’s supplies come and go by mule train, which causes visitors to really appreciate their surroundings and makes it extra special to enjoy a glass of ice cold lemonade at the end of your long hike from the Grand Canyon rim to Phantom Ranch.